Get Ready for SEWE 2013! When February comes to the Lowcountry, its time for the Southeastern Wildlife Exposition! SEWE 2013, a three-day celebration of nature featuring over 500 artists and exhibitors from around the world, comes to Charleston February 15-17. Wander around downtown Charleston this weekend and you’ll see amazing works of art focusing on wildlife and nature–not only paintings but also sculptures, furniture, and duck decoys! At Marion Square, you’ll find open-air demonstrations of all kinds, from cooking, to fly fishing, to birds of prey. But there are two things we love best about SEWE. 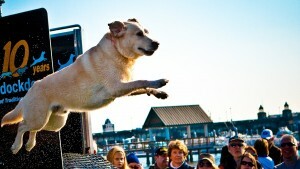 One is the Dock Dogs competition and retriever expo at Brittlebank Park, and the other is that SEWE is the first of many great festivals that run through the spring in Charleston. It may only be February, but SEWE makes us feel like spring is on its way!